As I've mentioned previously, I've been having a massive cull and reorganization of my house. 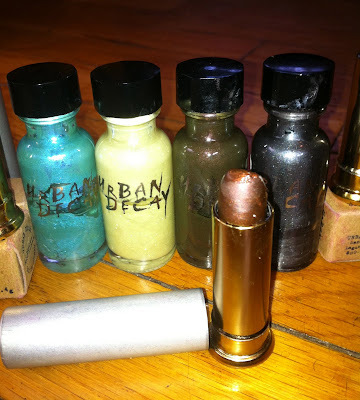 While going through my cosmetic stash I found in a box a curious thing. I found some original Urban Decay lipstick and nail polish that I had completely forgotten I still had. 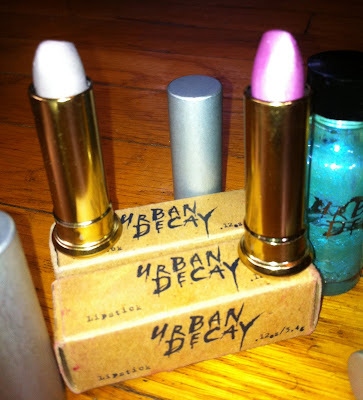 Back when Urban Decay first started around 1996, they were a boutique brand selling only lipstick and nail polish. My shop was one of the first (if not the first -- their site was the first to list my shop as a stockiest, which back then was very exciting!) t0 sell their fun, interesting line. It was a fantastic seller for us, and we did quite well with people seeking us out just to get their Urban Decay fix. I honestly had a hard time keeping up with demand! Once they moved into the mainstream department stores, sales dropped off so we stopped selling it as we liked to stock what you couldn't find easily, and stuck with boutique brands. But apparently I still had a few things left over all these years later, and thought you might find the packaging and colours interesting! Left to right: Lipstick in "Pallor" & "Asphyxia", Nail Polish in ? (lost tag! 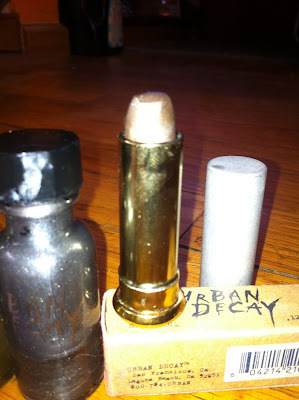 ), "Acid Rain", "Smog" with matching Lipstick in front, "Uzi", and Lipstick in "Oil Slick"
A few more closeups of the colours. Fans of Urban Decay can see just how far the brand has come today, still offering interesting colours and formulations while staying true to their aesthetic! I hope you enjoyed this little walk down memory lane! Wow! This is like a time warp for me! There was one boutique that sold this in my home country and I think I had smog lipstick. The boutique sold quirky and fabulous dresses for women and had some children's clothes. I bought my toddler son a pair of white shorts with ants all over them ("ants in your pants" and a wee black sweater with a green alien face (typical with the big eyes and head) and the green alien head glowed in the dark. Why oh why don't you have your store anymore? I'm glad it brought back fond memories! Hey I think I got my nephew a pair of those "ants in your pants" shorts too! I closed the store in '06 due to lack of recovery post 9/11 and more importantly the Marc Jacob-ization of the West Village. People no longer wanted quirky fun shops the WV was known for and wanted Soho West. Ugh. So fun to see this! I'm glad you enjoyed it! I was shocked I still had the stuff! Keep digging I want to see what else you find! Hmm think I might have some ANCIENT Dior and even stuff from the 50's! OMG! I used to go there all the time!!!!!!!!!!!!!!! if my memory serves me right you used to have coffin like changing rooms. i bought my 8th grade prom dress there it is this vintage 50's wiggles dress in with a cream colored lace. there was a huge sale and the dress was 5 dollars i still have it. thank you as well! me and my friends constantly talk about how much we miss all our fav old shops. would you be willing to sell any of the old UD you have? that would be awesome thanks!!! Dead, absolutely dead. I think if I ever find one of the old polishes I might need hospitalisation! so fun! These originals were the best. I remember I had the 'bruise' lipstick and nail polish and I just found some of my second generation UD nail polishes and they are still good! They really were! I was in Sephora over the weekend & the pigmentation is just not the same, Boo!